You are currently browsing the tag archive for the ‘Sarah Palin’ tag. She didn’t do herself any favors in last night’s softball interview with Sean Hannity. She underscored her misunderstanding of the historical significance of the term “blood libel,” continued to play the role of victim, and slammed the memorial service. Personally I thought her potential for being elected anything here on out was nixed when she quit as Alaska governor to cash in. But this interview didn’t help her either. As Howard Fineman said, it’s very bad when you’re a right winger on Sean Hannity and he asks you if your political career is over, and you can’t give him a straight answer. I don’t have the software on my work computer to post the video here directly from the Comedy Central site, and it’s not posted on Youtube yet, but last night’s show may be the farthest Colbert has pushed the envelope since he delivered biting satire while standing six feet away from the former President. I don’t think the Palin camp has the depth to deal with Colbert here, so I imagine she’ll probably let this slide and move on. Then again, Republicans can be gluttons for punishment as they have been over the past few days in calling for Brennan’s resignation because he ruffled their feathers over their partisan reaction to the Christmas would-be bomber. In any case, you don’t want to miss this one. Addendum: I’m having trouble with link. Here’s the video itself. Naming founding fathers is even trickier than naming newspapers and magazines. Even Beck lost patience with her. She did eventually come up with George Washington. She likes him because he didn’t want to be a king and he went back to Mt. Vernon. Did you hear that? She knows that Washington was from Mt. Vernon. So lay off! Can I call them or can I call them? As I (and probably a slew of others) predicted, Sarah Palin lands a job with Fox News. Fox is sort of the Hollywood Squares of conservative politics that way. Meanwhile, a book on Palin which had been comissioned from NBC reporter Matthew Berger has been dropped by the would-be publisher because “the marketplace changed.” Palin had sold 300,000 books in a single week. So when they say the marketplace had changed, are they talking Palin market saturation, or citing popularity which would make any books critical of her in any way unprofitable or even bad PR? Addendum: TPM has compiled her greatest hits on Fox News. Second addendum: Ooops. Looks like she’s quit already. The public option may be in the dustbin of history, but there are still four Senators determined to squeeze even the last bit of reform the bill might hold. Senator Sherrod Brown is caving to the pressure on the grounds that there’s still some “good stuff” in the bill. No word yet from Sanders or Feingold, however, we may be getting a dose of principle from a very unlikely source. We’ll see how long that lasts. No word from the House Progressive Caucus that I can find. Meanwhile, the Chamber of Commerce is offering opportunities to win gift certificates to Hooters. All you have to do is oppose health care reform. Unlike the purported Blue Cross/Blue Shield ads, this offer does not incentivise action; you just have to accept their emails. Blue Cross is claiming that the Facebook ads offering opportunities to win video games in return for sending an anti-reform email are fake. The same story notes ads offering opportunities to win a TV. Blue Cross has suspended all online advertising until they can “investigate” the matter. The executive director of the Arizona Republican Party has been charged with stalking. He’s accused of using the party’s database to stalk a female grad student. Mum from McCain so far. Add Chuck Schumer to the list of Limousine Liberals who have trouble getting along with the little people. I consider the Stewardess a heroine if she managed to slow up the HCR sell-out for a few hours. In a surprise move, Time Magazine named a warm body as Person of the Year. Naomi Klein is in Copenhagen. What she says in the video about “a deal” applies also to the health care debate. Synchronicity? She’s also telling Obama not to bother with Copenhagen because he’s already blown the opportunity. I haven’t kept up on the story to be able to discuss the details. Is Obama going for the long ball in Afghanistan? After last week’s tomato incident, Salt Lake City’s Costco isn’t taking any changes ahead of today’s book signing event. They’re removing the tomatoes. No word on the eggs. The Iranian guerrilla blogs have received much well-deserved coverage. Apparently it’s taking off in Cuba too. But the Cuban government seems to have more success in keeping the lid on the phenomenon. According to the National Office of Statistics (which doesn’t count anything outside of formal channels), out of a Cuban population of more than 11 million, only 1.5 million use the Internet. Online connections made through student or work centers ban “pornographic and counter-revolutionary” sites, creating an incriminating nexus between those two words, and denying access to almost everything published by Cubans abroad. Domestic connections authorized for individual government officials are, in practice, also domesticated: portals such as Cubanet and Cuba Encuentro, both exile news services, are blocked by the Cuban government, as are various proxy servers. Cuban national servers, such as Infomed and Cubarte only allow browsing on “.cu” domains, which are exclusively Cuban State pages and as such are a kind of cyber chastity belt euphemistically referred to as the “Intranet.” In practice what this means is that most of the few Cubans who have online access don’t, in fact, have access to the Worldwide Web at all—only to e-mail. Lastly, Barbara Ehrenreich posted a column calling for a new woman’s health movement in the aftermath of the new mamogram guidelines. Addendum: The subtle differences between liberal pols and conservatives – the former can’t get along with them while the latter just screw them over. I guess the reward was in the honor? “Don’t talk to her unless she talks to you first.” I wonder if that rule came down after the Couric interview. Also, I guess we are expected to take comfort in this. This kos poster argues that profound political sellouts are part of the history of every president, even liberal heroes like FDR. I’m over Sarah Palin. Her political career is probably over, and the story’s getting boring. But Shatner is just too funny to ignore. But what’s really disorienting – what is Howard Dean doing guest hosting Countdown??? Life is too short to compromise time and resources… it may be tempting and more comfortable to just keep your head down, plod along, and appease those who demand: “Sit down and shut up”, but that’s the worthless, easy path; that’s a quitter’s way out. Oh, and she’s a fighter too! So, is she really quitting because she thinks it would help her win the presidency in 2012? Is she quitting because a scandal is in the wings waiting to break? Does she have a Fox News show lined up? Or has she simply had enough? The normally sober conservative talking head William Kristol says it’s a “shrewd move.” I give this guy credit for his honesty in once admitting that the whole conservative “liberal media establishment” meme was pretty much conjured up to “work the ref.” But I think he’s scrambing for good news here. Here’s yet another opportunity for Mark Sanford to slip out of the headlines. Let’s see if he keeps his mouth shut this time. This one from Obama. So far nothing from McCain. 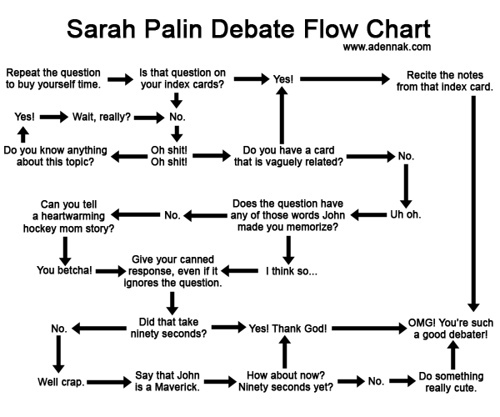 Addendum: Sarah Palin debate flow-chart. As always, you can click on it to enlarge. Begun the culture war has. A very wise TV executive once told me that the key to TV is projecting through the screen. It’s one of the keys to the success of, say, a Bill O’Reilly, who comes through the screen and grabs you by the throat. Palin too projects through the screen like crazy. 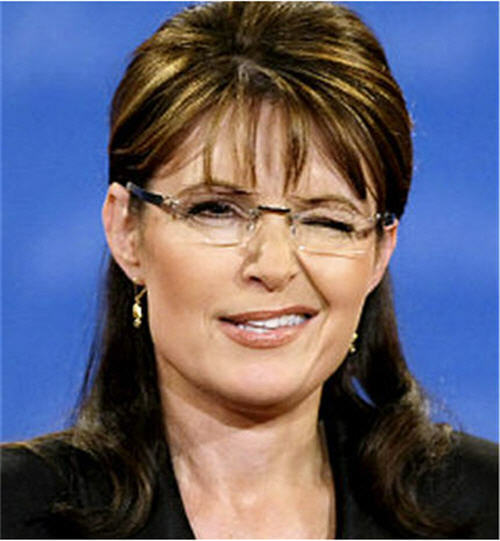 I’m sure I’m not the only male in America who, when Palin dropped her first wink, sat up a little straighter on the couch and said, “Hey, I think she just winked at me.” And her smile. By the end, when she clearly knew she was doing well, it was so sparkling it was almost mesmerizing. It sent little starbursts through the screen and ricocheting around the living rooms of America. This is a quality that can’t be learned; it’s either something you have or you don’t, and man, she’s got it. Third addendum: The story in advertising, from Talking Points Memo. The McCain campaign has now shifted virtually 100 percent of his national ad spending into negative ads attacking Obama, a detailed breakdown of his ad buys reveals. By contrast, the Obama campaign is devoting less than half of his spending on ads attacking McCain. More than half of its spending is going to a spot that doesn’t once mention his foe. It’s weird watching a presidential campaign where the Democrat can actually outspend the Republican in advertising. I don’t think that’s happened since Johnson clobbered AuH2O in 1964. If you check out this chart you’ll note that Obama is outspending in just about every state. He let up in Minnesota, and that’s the only state where McCain has actually made any recent movement. The only one. And McCain really ought to fire his online ad person. Last week they released ads claiming a debate win before the debate. This morning they forgot to find a “famous person” to own a lame review of Palin’s debate performance. Republican vice presidential candidate Sarah Palin, who has not held a press conference in nearly four weeks of campaigning, on Tuesday banned reporters from her first meetings with world leaders, allowing access only to photographers and a television crew. Those sessions and meetings scheduled for Wednesday are part of the Republican campaign’s effort to give Palin experience in foreign affairs. She has never met a foreign head of state and first traveled outside North America just last year. The campaign told the TV producer, print and wire reporters in the press pool that follows the Alaska governor that they would not be admitted with the photographers and camera crew taken in to photograph the meetings. At least two news organizations, including The Associated Press, objected and were told that the decision was not subject to discussion. TVNewser has learned all the networks were prepared to ban the use of pictures and video from Gov. Sarah Palin’s meetings at the UN today. The ban was in protest of the McCain campaign’s restriction on editorial presence. We hear the networks had arranged for a pool camera to cover all the meetings, and at least three journalists were to be present as well (one print, one radio, one TV). Earlier today, the McCain campaign said it would allow just one editorial person inside. Later, the campaign limited it to a camera only. “What is his name?,” Palin asked. “He is the only one we have,” remarked Karzai. At this point, the pool was hustled out the room and down to the hotel lobby. Pool was in the room for a grand total of 29 seconds. Addendum: The Humane Society has endorsed Obama. And remember last week when the McCain campaign was trying to tie Obama to Freddie Mac? Man did that ever backfire! Meanwhile, conservative columnist George Will slammed McCain yesterday, criticizing his temperament over the past week’s financial crisis. Will he endorse Obama? On the other side, Joe Biden broke ranks with the campaign and called that lame ad about McCain’s computer ignorance “terrible.” I bet he got a yelling at this morning. Second addendum: CNN’s Campbell Brown comments on the sexist treatment of Sarah Palin. It’s a keeper. For those of you on dial-up, here’s the transcript. This is what happens when campaigns let reporters into photo ops. They get all uppity and ask questions. He’s giving $100.00 to the Alaska Special Olympics (whose funds she slashed) for every lie she or her campaign tells. $3,700.00 so far. Meanwhile, her pastor is a witch hunter! Didn’t take long for me to make another Palin post. There’s just too much great material! Addendum: Keith may have to pony up another hundred. The McCain-Palin campaign echoed the charge in a press release it distributed Monday, concurrent with Palin’s legal filing. “Mr. Monegan persisted in planning to make the unauthorized lobbying trip to D.C.,” the release stated. But the governor’s staff authorized the trip, according to an internal travel document from the Department of Public Safety, released Friday in response to an open records request.